Seeing his grandmother’s wide smile and warm glow as family members thanked her for cooking Sunday lunch inspired Gabriel to make feeding people his job. Born and raised in Peru, he draws on his humble origins to create simple, tasty dishes connected to his memories. Arriving in Australia nearly a decade ago via the US, the Brisbane-based chef brings the street to the table by refining typical South America street food dishes. This is very typically Mexican, but not something you find in restaurants in Australia. My step-dad lived in Mexico for a couple of years and he’s always been pushing my mum to make him tongue tacos – and so I did. The meat is very soft. It’s fatty but buttery – it melts in your mouth. Beer is the best option. I’m an IPA fan, and they have a strong, bitter taste so they pair nicely. In a large pot, heat the oil until almost smoky. Fry the onion, celery, carrots and garlic until soft. Deglaze with white wine, then add the thyme. 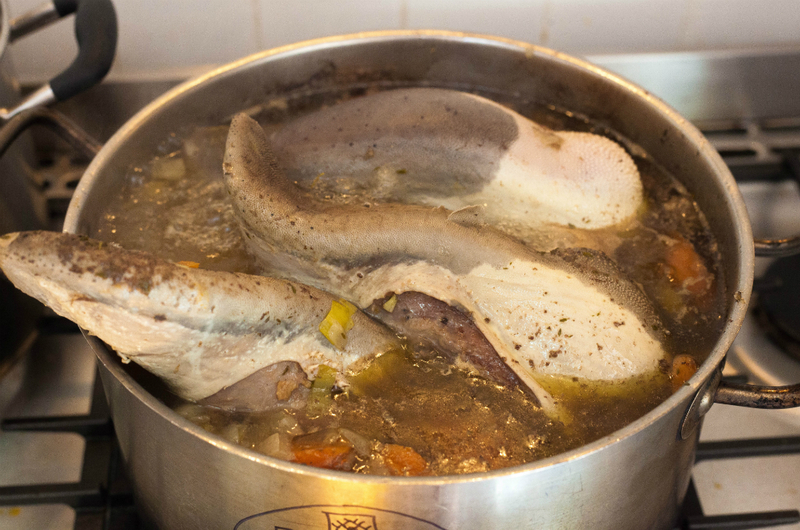 Cook until the wine has almost evaporated completely and add water. Add the tongues and bring to a boil. When the water breaks boiling point, add salt and turn the heat down low. Let simmer for three hours uncovered. If needed top water up so the meat remains covered. The tongues are ready when the skin comes off almost effortlessly and they feel tender to touch Drain liquid, remove the thick skin and let cool in the fridge. Once completely cooled, slice the meat into small 1cm cubes. While the tongues are cooking, make salsa verde. If using tinned tomatillos, drain before placing in a food processor or blender with the rest of the salsa verde ingredients. Blend until everything is combined. Transfer the salsa verde to a sauce pan and bring to a boil. Once boiling lower heat to a simmer and cook for 20 minutes, stirring occasionally. Remove from stove and cool in the fridge. Once cooled down it should have a thick almost creamy consistency. 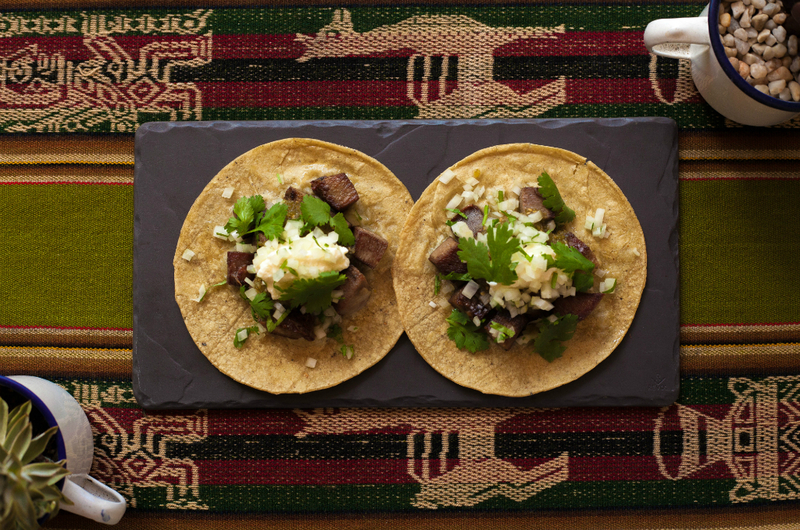 Fry the corn tortillas in a dry pan for up to one minute per side. Pile them up and wrap in a clean tea towel so the tortillas do not dry and crack. In another frying pan, add olive oil and fry tongue cubes on high heat until they develop a crispy, brown exterior. 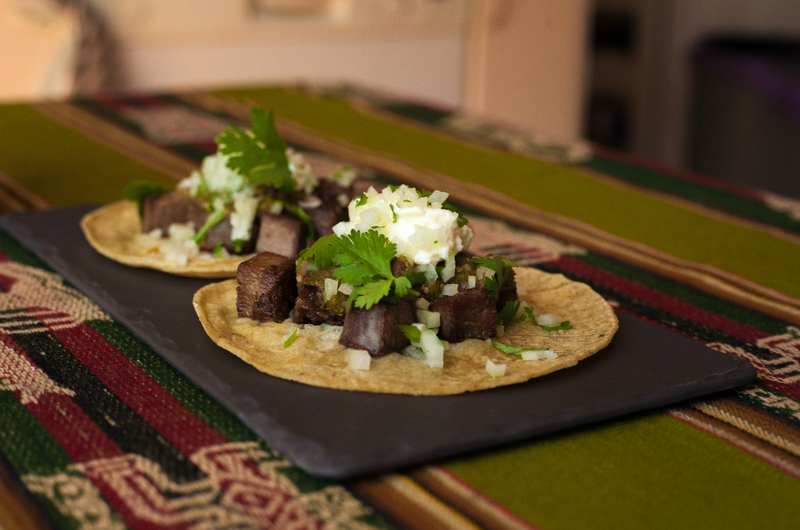 To assemble tacos, spoon salsa verde on top of the meat. Top it off with fresh coriander and diced red onion as garnish. Tip: To check if the tongues are ready, the skin should easily peel off the larger one. Tongues have a thick, almost leathery skin on them that is not edible. Tomatillos are a variety of tomatoes that have green colour and are tart in taste.